After 144 races of 250 scheduled in the 30th annual Speedway Motors Tulsa Shootout, the cream is quickly rising to the top as 25 drivers have eared multiple victories across the eight available classes. Combined results from Wednesday and Thursday night put’s Tyson Hall atop the win chart with four. All classes have completed the scheduled 128 Heat Races with three – 1,200cc Mini Sprints, “A” Class, and Outlaw Non-Wing – having run their Qualifiers to determine A-Feature lock-ins; with west coast drivers looking primed for victory. In search of his first Golden Driller, Washington’s Jarred Gunderson will lead the field to the green in the 1,200cc Mini Sprints on Saturday night. With a pair of wins for each so far this week, California’s Scelzi Motorsports has positioned their drivers on the pole of two A-Features with the younger, Giovani, scheduled for the front row of the “A” Class-Winged feature. Older brother, Dominic, will lead the charge in the Outlaw Non-Wing A-Feature. Flirting with victory the past couple years, neither has been able to hold the coveted trophy on Saturday night. With a few late check-ins, the 1,200cc Mini Sprints and ECOtec Midgets entry list has climbed to 1,007 among 549 drivers from 26 states and Canada. 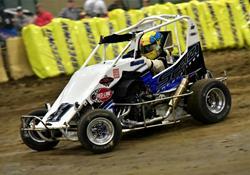 The 30th annual Speedway Motors Tulsa Shootout continues all weekend with action going on throughout each day.